Kolkata, Oct 27 (IANS) The England team doing duty at the ongoing FIFA U-17 World Cup have improved a lot after their loss to Spain on penalties at the UEFA European championship for the same age group earlier this year, Spanish coach Santiago Denia said on Friday, the eve of the final between the two crack sides here. “I believe England have improved in every aspect of the game. Defensively they are much better. 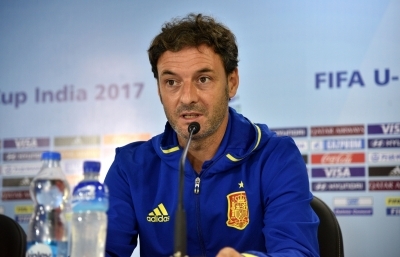 In the offence, they speak for themselves through their game, they are much better than how they were during the Euro under-17 championship,” Denia told the media. England and Spain are slated to clash for the U-17 World Cup title at the Vivekananda Yuva Bharati Krirangan on Saturday in a rematch of the summit duel between the two rivals in Varaždin, Croatia on May 19, when Spain had drawn level in added time, before winning 4-1 on penalties. None of the teams have won the tournament so far. Speaking about his boys, Denia said they were highly motivated for the big fight. “It is a big, big chance for us. We have worked for two years, aiming for this moment. We hope to play our best game and take the trophy home,” he said. Asked whether he had devised any plans to stop lethal English striker Rhian Brewster, who has fired back to back hat-tricks in the quarter final and semi final, the Spanish coach said his boys would be up against the England tem as a whole rather than against any individual player. “He is a good player. But my job as a coach is to defend against the English team rather than against any individual player,” Denia said. Denia said La Rosita, as the Spanish U-17 boys are called, had all the answers to the physical game of England. “It is possible that England are more physical. But as a European team, we have faced more physical teams. So, tomorrow we will have all the answers,” he said. Sancho had to leave the England squad after the group stages to fulfill his commitments with German club Borussia Dortmund. The coach said his boys were under no pressure before the big match day. “There is no pressure on us. We are highly motivated to take up the challenge and win a tournament which no other Spanish teams have won before,” he said.